*Food insecurity exists within a household when one or more members do not have access to the variety or quantity of food that they need due to lack of money. Source: First Nations Information Governance Centre (FNIGC) (2012). First Nations Regional Health Survey (RHS) 2008/10: National report on adults, youth and children living in First Nations communities. Ottawa: FNIGC. https://fnigc.ca/sites/default/files/docs/first_nations_regional_health_survey_rhs_2008-10_-_national_report.pdf -accessed November 12, 2017. 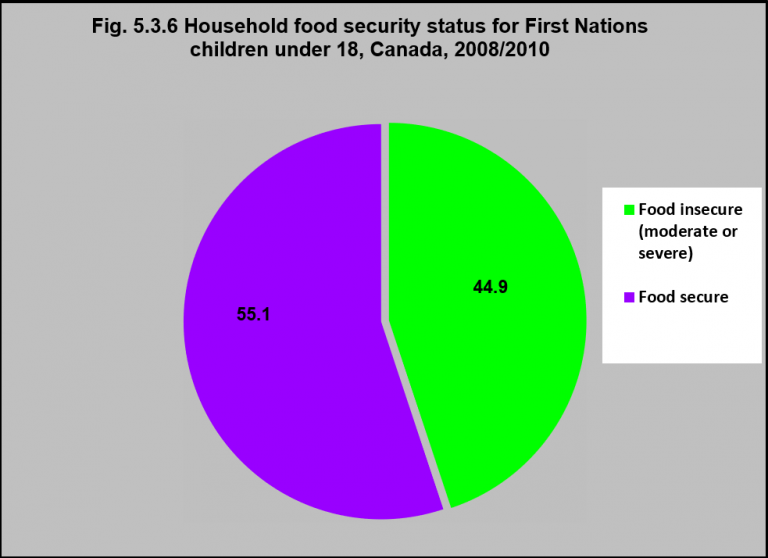 In 2008/10, 45% of First Nations children under age 18 lived in households who were experiencing food insecurity – either moderate or severe.